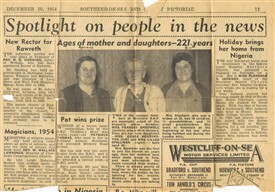 Here is a newspaper clipping from the Southend On Sea & County Pictorial, from December the 10th 1954. It concerns my great grandmother Frances Shadwell (Fanny). The article states that Francis is the oldest member of the club being 89 in January. Her twin daughters are also members of the OAP club, both at 66 years of age. Lillian & Grace do the catering for the club, which seems to have confused many people! Frances was born in 1866 St Lukes London. She had a very hard life, having to give up two of her children to the workhouse in 1915. Her husband just vanished around 1914, and left her to cope. If anyone remembers Frances, or her twin daughters please feel free to get in touch. This page was added by Doug Shadwell on 24/05/2016.